The Wood Butchers Guide to Technology: Touch, Voice, Sight - is smell next ? 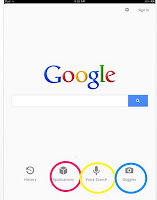 Google App for iPad. Touch, Voice, Sight - is smell next ? Google App for iPad. It is quite interesting the "rivalry " between Google and Apple. Amusing for us users because the more they compete with each other the more benefit we consumers gain. Many of us think of "Google" as a search engine. I even have a friend who refers to looking something up as - why not use "the google" as if it is a noun. 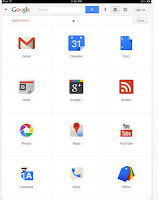 Others, of course, know Google as the maker of a wide range of very useful apps. I came across one recently that I hadn't noticed before (in fact I'm not sure whether it was just released or whether I hadn't noticed it before). It was one I downloaded for my iPad but it is also available for iPhone, (I also believe there is a version for Android). The app is simply called "Google Search". This little app has quite a number of handy features. 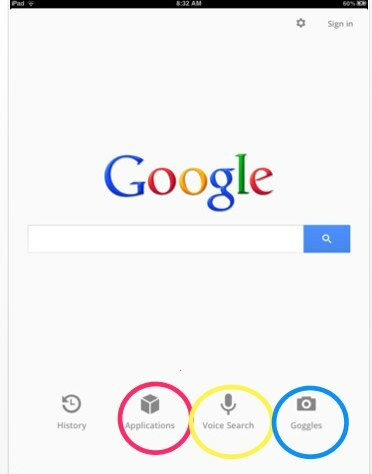 When the app first opens you get the normal looking Google search bar . But down below there are three interesting connections. I'll start in the middle first. The yellow circle - Voice Search.Activate this and a microphone appears. Say a word or phrase for what you are searching and a second or two later a list of web sites appear. Very nifty. The red one on the left "Applications". 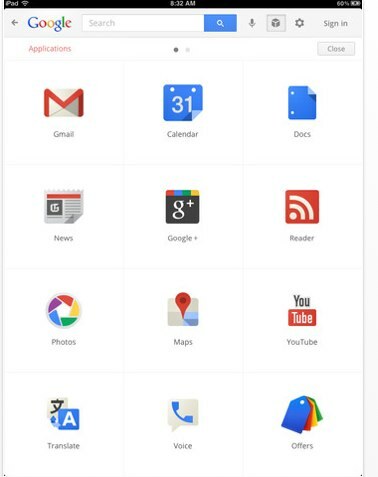 This brings up a page of Google apps - gmail, google docs, Youtube, calendar etc. Most people have a gmail and probably some goggle docs - so it is handy to have these connections come up on the one interface. Although I must admit I don't care for their calendar app here - much prefer iCal or even the web interface for Google calendar. The third one , the blue one, goggles, is the exciting one. Click on this and your camera comes up. Take a photo of a well known landmark, book cover, bottle of wine, artwork, text, and it comes up with a listing of websites, photos, information and so on. It's early days yet and it's fairly limited to what it will find but it really takes the aspect of the visual search that one step further on. Like the aspect of touch that was introduced to our computing use (iPads, smartphones etc) - the voice and visual aspect is the next game changer. That is what Goggle is trying to incorporate here - and reasonably successfully. These new but subtle changes have a habit of creeping in and by the time we turn around twice everybody is using them and they are a normal aspect of their computing/communication. I am amazed how underrated the the introduction of Siri is with the new iPhone. I personally find this little feature is going to be the big change maker in the next couple of years - but at the moment most people just yawn and go "big deal - so what - it doesn't even work that well". But I think they underrate the potential of what is happening. Time will tell.